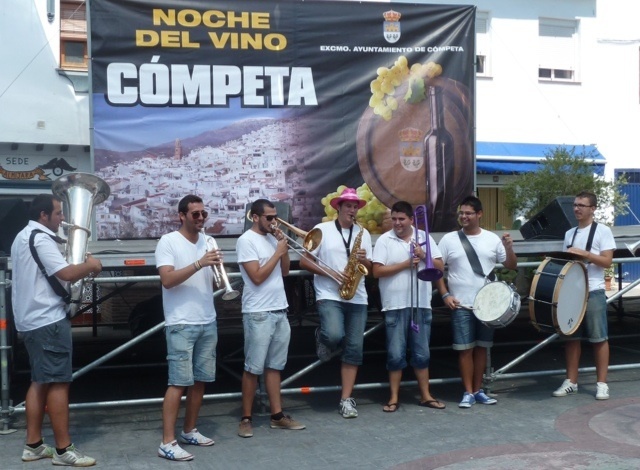 No sooner are the ferias over than it is time for the night of the wine, Competa’s annual celebration of the grape harvest, held every year on 15 August. The white mountain village of Cómpeta with a snow-capped mount Maroma as a backdrop. La Noche del Vino festival developed from an age old tradition of villagers meeting to mark the beginning of the grape harvest. The muscatel vines that scramble over the surrounding hillsides produce the very popular wine of the region, best known in its sweet, sherry like, form, but also produced in medium and dry varieties. 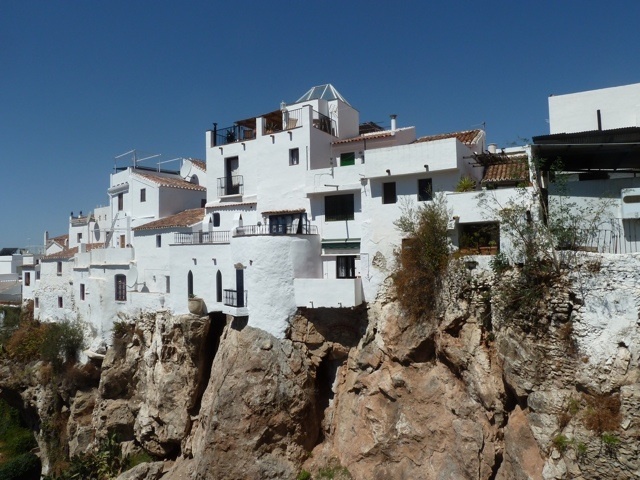 We have two substantial bodegas in the area – Bodega Almijara (Jarel) on the edge of Competa, and Bodega Bentomiz (Ariyanas) situated between Competa and Sayalonga. Both these bodegas have an international clientele. But we are not restricted to buying our wines from these major wineries. Almost all local Spanish people seem to have a plot of land (finca) where they tend their ancient vines and there are many small farmers that produce a couple of barrels of wine each year. Although the local tipple is most commonly referred to as Cómpeta wine, do not make the mistake of asking for this variety in the bars of Canillas de Albaida, Archez or any of their neighbouring villages, which will all stock the wine produced in their immediate vicinity, and are very quick to let you know the wine is from their own village and not Cómpeta! It is easier to ask for ‘vino del terreno’ and then no-one will be offended. 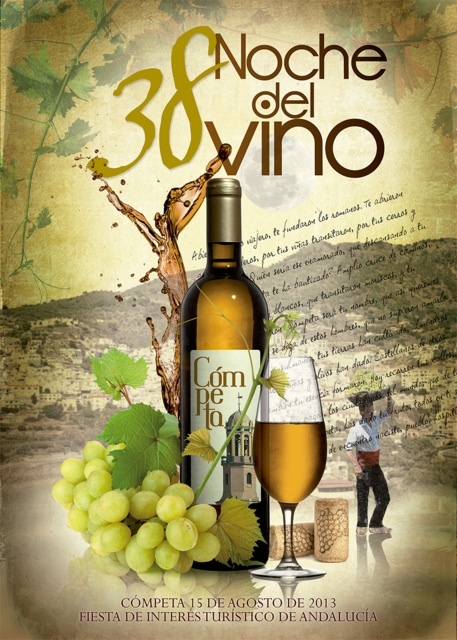 The festival of la Noche del Vino is now in its 38th year as an organised event, growing in stature by the year. 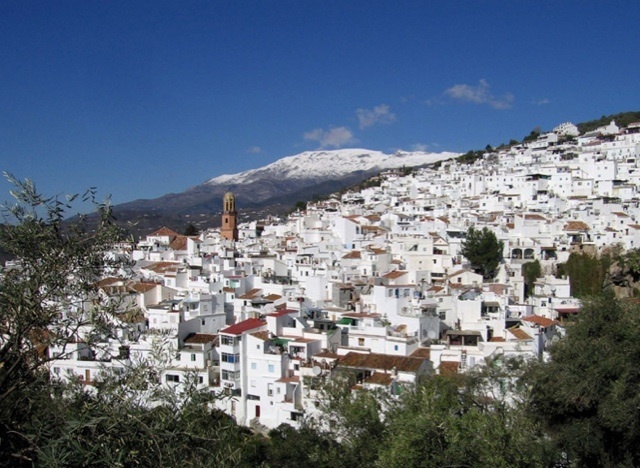 it has now been declared by the government of Andalusia a festival of national touristic interest (‘Declaración de Interés Turístico National de Andalucia’) and attracts many thousands of visitors to the village for the occasion. Each year the town hall runs a competition for local artists to design a poster for the event which is displayed in the windows of all local businesses and is much sought after by locals and visitors alike and many of these posters are framed to brighten up the walls of homes near and far. 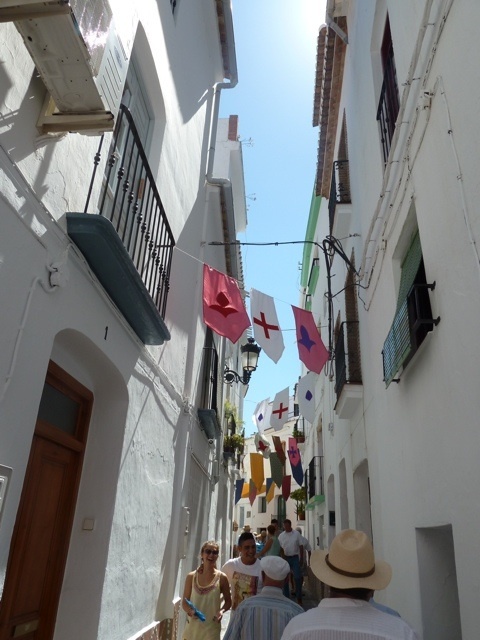 The event takes place in two of Competa’s plazas, and the narrow connecting streets are adorned with colourful flags and bunting. Here you will find craft and food stalls offering a wide variety of products. 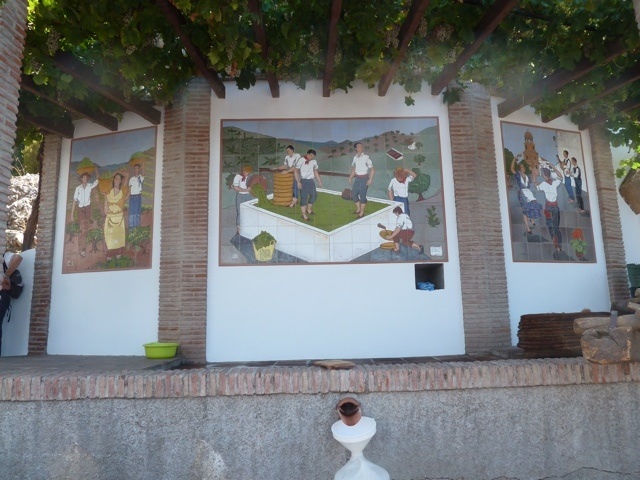 The festivities commence in Plaza Vendimia, which has recently been refurbished to create a fabulous new viewing terrace, where the village statue of a farmer carryng a basket of grapes on his head, has been repositioned to great effect. A large stage has been erected at one side of the square and various musicians and dance troupes perform here throughout the day as the crowd of villagers and visitors swell to fill the space under a huge tarpaulin that has been strung across the plaza to provide some shade for the onlookers. 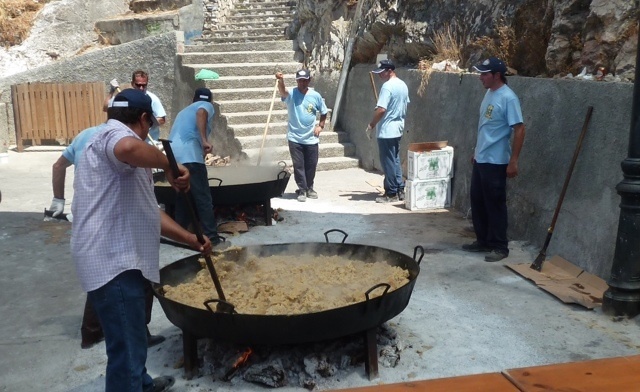 On another side of the square in a roped off area, a group of villagers is busy preparing a feast for the visitors (handed out free of charge), where probably the biggest frying pan you have ever seen is used to prepare the traditional dish of migas (breadcrumbs cooked with garlic and olive oil), and served with bacalao (dried salt cod), salad, and of course a bunch of grapes freshly harvested from the hillsides surrounding the village. On a third side of the square is a dedicated platform for the annual grape treading ceremony that takes place during the fiesta. Two farmers dressed in traditional attire and accompanied by a troupe of musicians, parade through the crowds carrying baskets of grapes on their heads, making their way towards the platform, which is beautifully decorated with tiled panels depicting local traditions. This ceremony is programmed to take place at twelve noon, but it is usually nearer 2pm when the treading commences, normal procedure here in Spain. The baskets are then emptied into the shallow trough, where the treading takes place and the resultant juice pours through a spout and is caught in a large vat, all the while accompanied by the musicians. In addition to the free food, there is free Cómpeta wine served to all who want to try it for the first time, and also to those who are very familiar with the taste. The wine tastes similar to sherry and is equally potent, so the small glasses are served with the intention that people do not over-indulge. Throughout the afternoon the crowd are entertained by a succession of performers on the stage, both locals and visiting groups of musicians and dancers. The pop group FiestaSur are due to be on stage at 3.30pm, but we left at about this time so missed out on the concert. The Spanish seem never to grow tired of loud, bouncy music. I admire their stamina, but we have had enough of a good thing for the time being, and want to keep some energy in reserve for the night-time programme of events. So we return home to have a siesta and tend to the animals’ needs and eventually arrive back in Cómpeta at 11:30pm. The main square in Cómpeta is Plaza Almijara, reached via a very steep incline that leaves most people puffing and panting by the time they reach the top. It is very pretty, dominated by the magnificent parish church with its soaring tower, topped with a golden dome. The tall buildings around the plaza are constructed in a traditional style with several popular bars/restaurants where you can catch your breath with a cool beer or cup of coffee. It is very popular with locals and visitors alike and the scene of regular entertainment by our excellent local musicians. Here are some views of what the Plaza Almijara usually looks like with the recently constructed Paseo de las Tradiciones alongside the church. and this is how it looked during the day of the 15th August, with the special stage that is erected every year for the flamenco performances, depicting an old finca with a drying bed full of grapes (grapes are arranged in south-facing ‘drying beds’ for a few days so that the fruit soaks up the sun and develops the sweetness that the local wine is renowned for. The performers enter and exit the stage via the door of the finca. We return to the square in good time – by 11:30pm the speeches have been made and there are some youngsters on the stage singing flamenco. Now, listening to flamenco is an acquired taste, and it is a taste that generally us guiris (foreigners) do not find as palatable as the Cómpeta wine. The place is absolutely packed, all tables in the restaurants have been reserved for weeks and every chair that forms the temporary open-air auditorium is taken. We squeeze through the melee of miscellaneous bodies and make our way behind the stage expecting to find a spare seat in Oscar’s bar, but even though there is no view of the proceedings from here, it is also rammed full. But the lovely Oscar rescues us by producing an extra table from within the restaurant and soon has us seated with glasses of wine in front of us. And to our delight, sitting at a table directly in front of us are three guys with instruments – a six string and a twelve string guitar and something that resembles a lute – and we sit and listen to them playing and singing as if it were a personal performance. After a couple of glasses of wine at Oscars we work our way back to the main square, by which time the flamenco dancing has commenced, accompanied by the singing, which somehow is much easier to listen to when accompanied by dancers. The show is brilliant, the square has an amazing atmosphere jammed full of locals and visitors, Spanish and foreigners, all enjoying every moment of the spectacular show, provided free of charge by the townhall of Cómpeta. The square at night has a totally different ambience, with the stage and the church tower picked out by colourful lights. The dancing continues well into the early hours. While I am taking the video below, David is tasked with fetching some drinks and on his way he finds some friends who fit us in around their table, and hey presto, we have a great view and great company. And to add to the perfection we find that we are sitting next to the free bar, still serving Cómpeta wine! Like I said before – the Spanish certainly know how to throw a party. The show comes to an end at about 3:00am, earlier than in years past, and on our way back down the hill David is inexorably drawn towards the churro vendor. I declined to join him in his indulgence, and then proceeded to eat my way through at least half of his churros. And he didn’t even complain – what a gentleman! If you enjoyed this post, feel free to follow the blog by signing up at the top of the sidebar, or follow Trepidatious Traveller on Facebook or Twitter. It’s always a good day and night! I’ve been trying to find out what happened to the little girl that was part of the statue when it lived in Plaza Almijara, in front of the church. There’s some suggestion it got broken in the move. I’m sure that’s right Marianne – I seem to remember that her arm got broken and I expect it was easier to remove her than mend her. This year’s noche del vino will be extra special as my daughter and family are coming over.